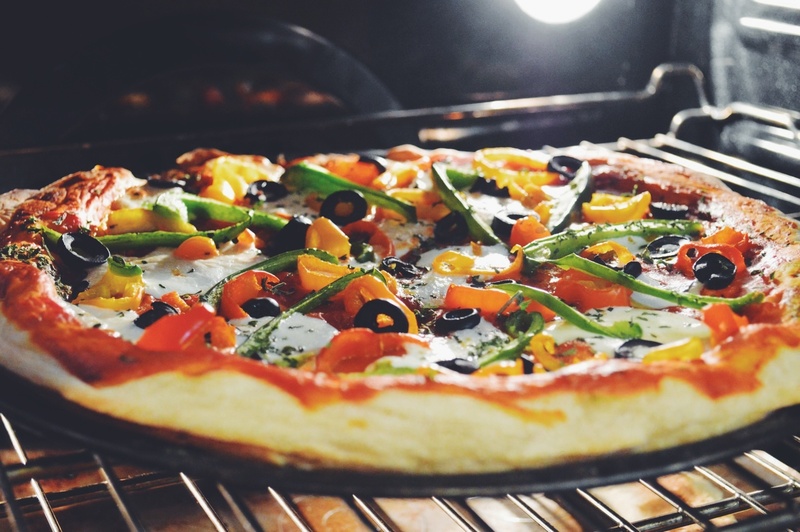 Artisan pizza is an imaginative, creative experience pairing seemingly random ingredients to create an earthy concoction of tastes. Tart, spicy, creamy, and sweet make this pizza absolutely delicious. Preheat the oven to 400 degrees F. Peel the butternut squash, remove seeds, and dice into bite sized cubes. Place squash on a baking dish/sheet and drizzle with melted butter. Sprinkle over the brown sugar, salt, and pepper evenly. Toss the squash in the mixture and spread them out flat on the baking sheet. Roast the squash for about 50 minutes until tender and caramelized. Remember to occasionally turn over the squash over while roasting to make all sides brown evenly. Meanwhile, prepare some Jain pesto which will be used as the sauce. Knead together Bisquick with warm water, salt, olive oil, and herbs– adding water as needed till pizza dough forms. Let sit for 10 minutes. 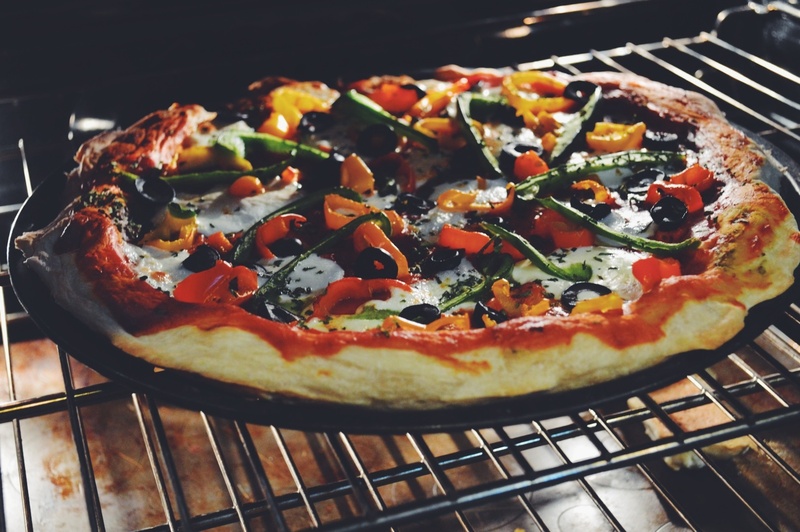 Roll out 1/2 inch thick crust and place on a pizza tray or baking sheet. Pre-bake the crust at about 350 F for 7-10 minutes until edges start to turn golden. 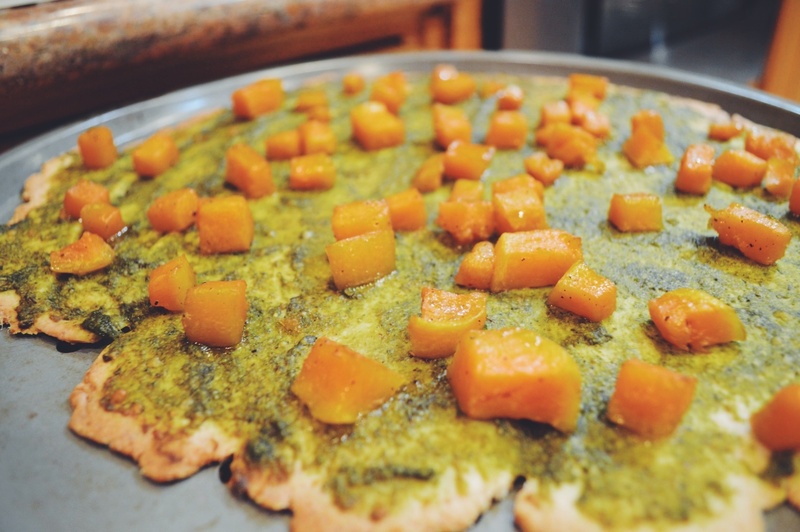 Spread Jain pesto on the rolled out crust, and top with caramelized butternut and scoops of creamy goat cheese. 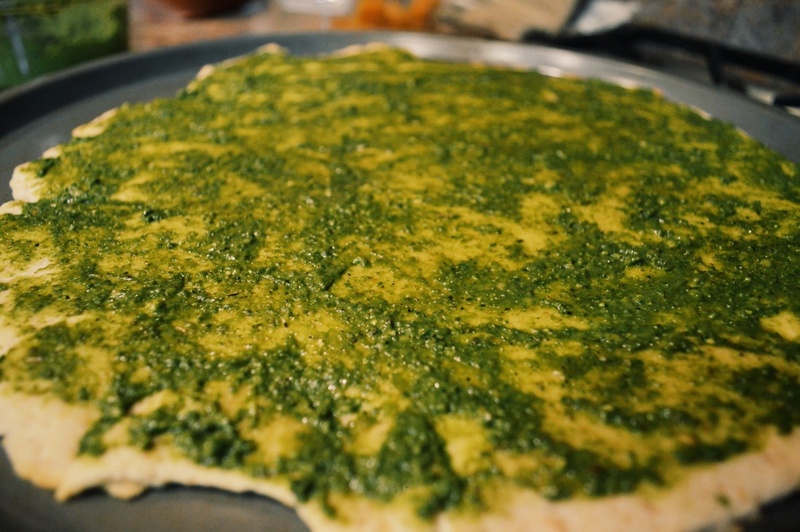 Place back into the oven to bake in the oven at 350 degrees F until pesto and crust seem baked and goat cheese is slightly melted, about 10-12 more minutes. Lower the oven temperature to 250 degrees, and remove the pizza. Top with fresh arugula and put back in the oven for 2-3 minutes to warm the arugula, but don’t let it cook! Remove from oven and generously top off with pomegranate arils. Slice into square pieces and serve! 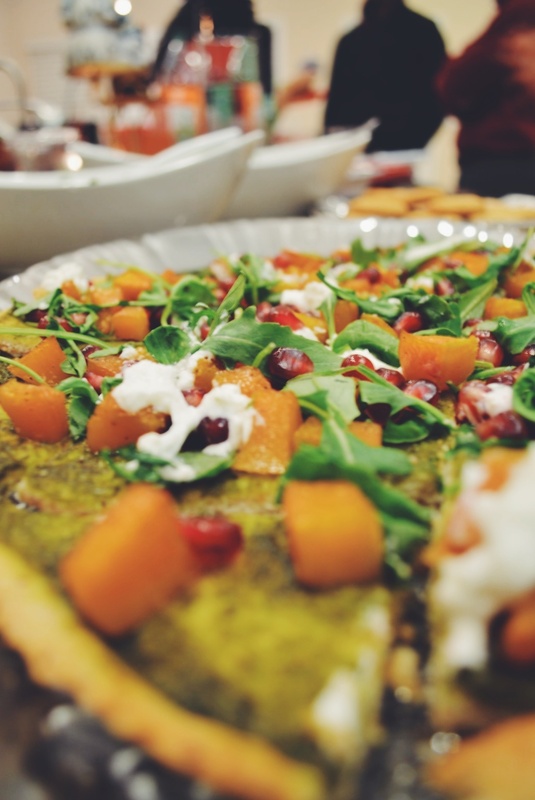 This pizza makes a great appetizer at family gatherings. I made it for a Christmas party and it was gone quick! Enjoy your new artisan creation! Of course if you want, you can use the same type of Bisquick crust, and roll it a little thicker to make a normal homemade pizza! Top off with fresh mozzerella slices and your favorite Jain veggies. Not sure how to make Jain red pizza sauce? Now you do 🙂 Chilli infused olive oil, oregano, and fresh cilantro make great toppings on the finished pizza!